Marxian optimal growth theory was developed to provide direction to the basic proposition of Marxian historical materialism on the basis of the labor theory of value and is also based on the optimization theory of individual agents so as to connect to modern economic theory. 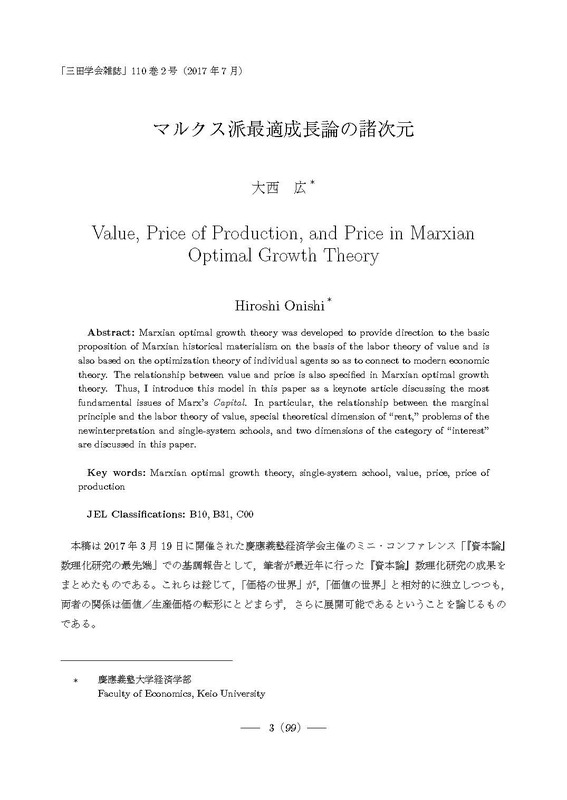 The relationship between value and price is also specified in Marxian optimal growth theory. Thus, I introduce this model in this paper as a keynote article discussing the most fundamental issues of Marx's Capital. In particular, the relationship between the marginal principle and the labor theory of value, special theoretical dimension of "rent," problems of the newinterpretation and single-system schools, and two dimensions of the category of "interest" are discussed in this paper.